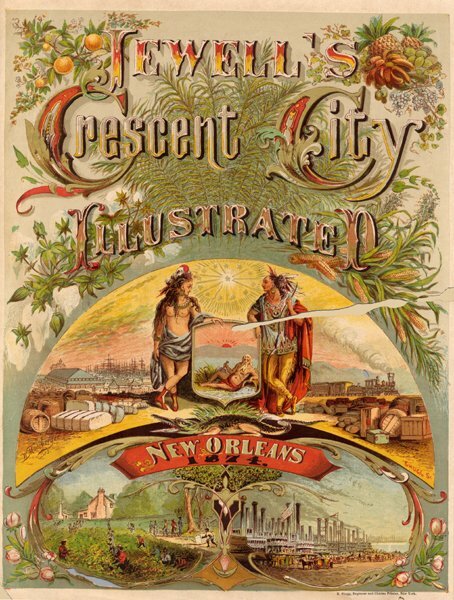 Title Page, Jewell's Crescent City Illustrated, 1873. There are at least two versions of Jewell's, one of 336 pages and a second of 112 pages, both published in 1873. The latter edition also includes a folded map of the city and a "strangers' guide." The color title page below is from the longer, 336 page version. New Orleans Guide, With Descriptions of the Routes to New Orleans, Sights of the City Arranged Alphabetically, and Other Information Useful to Travellers; Also, Outlines of the History of Louisiana, by James S. Zacharie, 1885.